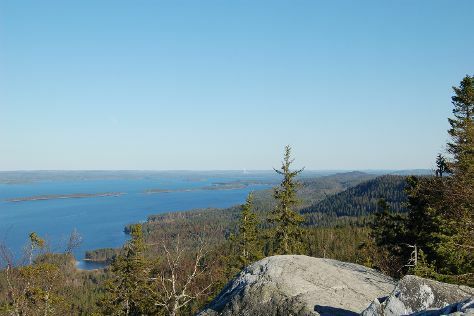 Get out of town with these interesting Koli National Park side-trips: New Valamo Monastery (in Heinavesi) and Joensuu (Sculpture Susi Kosiomatkalla, Botania - Botanical Garden and Tropical Butterfly Garden, & more). To find more things to do, traveler tips, reviews, and other tourist information, use the Koli National Park trip itinerary builder site . Helsinki to Koli National Park is an approximately 4.5-hour flight. You can also drive. While traveling from Helsinki, expect little chillier days and about the same nights in Koli National Park, ranging from highs of 6°C to lows of -2°C. Finish your sightseeing early on the 16th (Tue) to allow enough time to travel to Jyvaskyla. Jyväskylä is a city and municipality in Finland and in the western part of the Finnish Lakeland. Venture out of the city with trips to Mantta-Vilppula (Serlachius Museum Gosta & Serlachius Museum Gustaf), Petajavesi Old Church (in Petajavesi) and Himos Ski Resort (in Jamsa). And it doesn't end there: learn about all things military at Finnish Air Force Museum, examine the collection at The Craft Museum of Finland, go for a walk through Tourujoen luontopolku, and stop by Punnitse & Saasta. To find ratings, photos, and other tourist information, go to the Jyvaskyla trip planner. Drive from Koli National Park to Jyvaskyla in 4 hours. In April, daily temperatures in Jyvaskyla can reach 7°C, while at night they dip to -3°C. Wrap up your sightseeing on the 19th (Fri) early enough to drive back home.